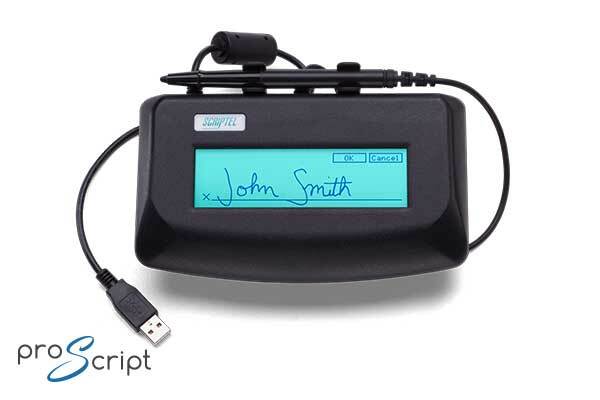 Scriptel's ScripTouch series electronic signature pads are all verified Citrix Ready and feature rugged construction and high reliability for frequent transactions and long lifetimes. 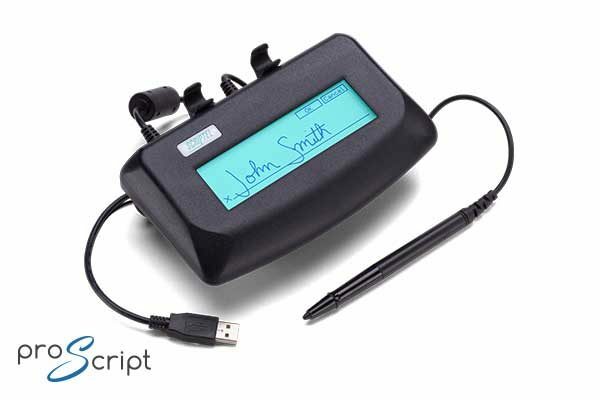 Scriptel's active battery-less tethered pen is proven to perform flawlessly through more than 1 million signatures. The signature sensing layer is a solid, durable, no-scratch, glass signing surface on top of the backlit LCD for great device durability. Signature quality is not affected by wear or heavy use and there are no batteries to replace. 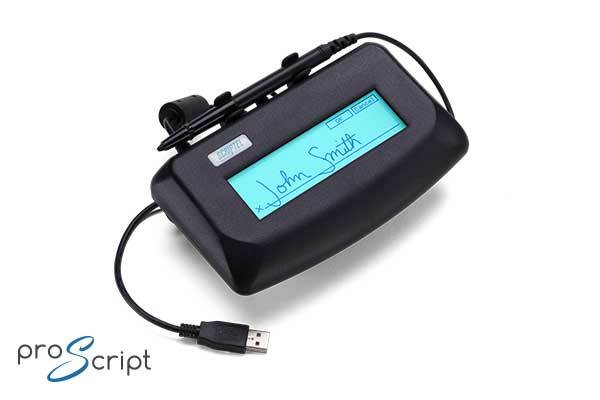 The ScripTouch ST1500B with ProScript device interface brings all these characteristics to the market in a rugged design with a no-scratch, backlit LCD that is perfectly suited for high transaction volumes and use in serving the public. The LCD display provides immediate rendering and visual feedback to the signer avoiding the need to have an additional display for the confirmation. Using ScripTouch free downloads, signatures can be captured in real-time with ScripTouch Sign and Save, Adobe Reader XI and DC, Adobe Acrobat XI and DC, Microsoft Word 2013 and 2016, Microsoft Excel 2013 and 2016, Google Docs, Google Sheets, OpenOffice Writer, OpenOffice Calc, and TWAIN in many popular image formats. ProScript is the best solution for signatures in desktop installed software, including Scriptel's free Sign and Save standalone signature software. ProScript also makes it easy to sign within popular desktop applications like Microsoft Office or Adobe Acrobat/Reader. Please refer to the list of supported software plugins that are available with Sign and Save. ProScript is also compatible with a variety of popular software applications. Please check our Software Partners page for a list of our key partners. If you don't find your software on the list, please check with your software vendor for compatibility with Scriptel signature pads. A universal solution for USB Forwarding. ScripTouch Remote is used with Citrix and RDP-based (e.g. Terminal Services) systems to create a virtual channel from the client to the server for USB communication with the Scriptel signature pad. It is robust and simple to install. 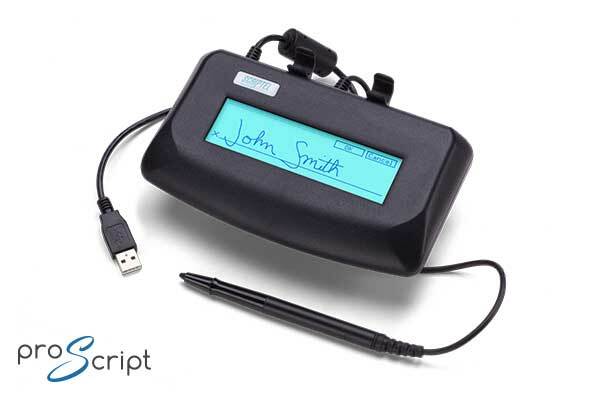 Even in cases where the system supports USB forwarding natively (such as with Citrix XenDestop 7.5 and above), administrators may appreciate the additional ease of managing Scriptel signature pad connections that is available by using ScripTouch Remote. ScripTouch Remote is free to download within our ScripTouch Sign and Save software suite but is not activated. It is free to activate for a 30 day trial period. Thereafter, a license must be purchased for each Scriptel signature pad. Licenses are allocated to registered users and activation is a simple online process. USB bus-powered, no separate external power supply needed. Citrix Ready and ScripTouch Remote (USB virtualization tool) available. Support available for Windows, Mac OS and Linux. Copyright © 2015 - 2019 Scriptel Corporation. All rights reserved. Scriptel®, ScripTouch®, Assist™, EasyScript™, mSign®, OmniScript™, ProScript™, StaticCap™, and Sign and Save™, along with their associated logos, are the property of Scriptel Corporation.